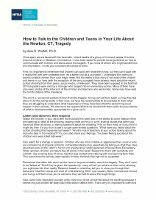 Many of us have been faced with having to answer questions about the tragedy that occurred in Newtown, Connecticut. A helpful article has been offered by the National Funeral Directors Association that was written by renowned grief expert, Dr. Alan Wolfelt. Dr. Wolfelt says in part: “we cannot protect children from the tragedy, but we can let them teach us how they feel about it.” This article is a helpful resource for anyone dealing with children and teens. You can download Dr. Wolfelt’s article here. Please share the information with anyone you feel it would benefit. 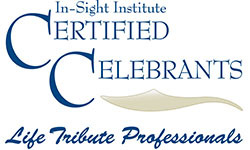 Many thanks to Dr. Alan Wolfelt (www.CenterForLoss.com) and the NFDA (www.nfda.org) for making this resource available. Please contact us if you need additional resources.